Paver block is an innovative way for creating decorative pavements. Every paver block materials (concrete, clay, natural stone) contain some special quality as compared to other materials. Block paving is the best option for your patio, driveway, pathway, but before installing any types of paver, you need to know about advantages and disadvantages of interlocking paver block, though it has many advantages that outweigh the disadvantages. Here we have discussed some disadvantages of interlocking paver block. Interlocking is a unique quality of block paving hence when blocks are not properly interlocked with each other, then weed and moss may grow between the space of blocks, and quickly spread to the entire area. During installation of paver blocks airborne seeds settle down in the sand, and after sometime, it also grows between the paver blocks. Due to regular cleaning of block paving it causes sand to get washed out, thereby gaps are created and hence weed and moss grows between the pavers. 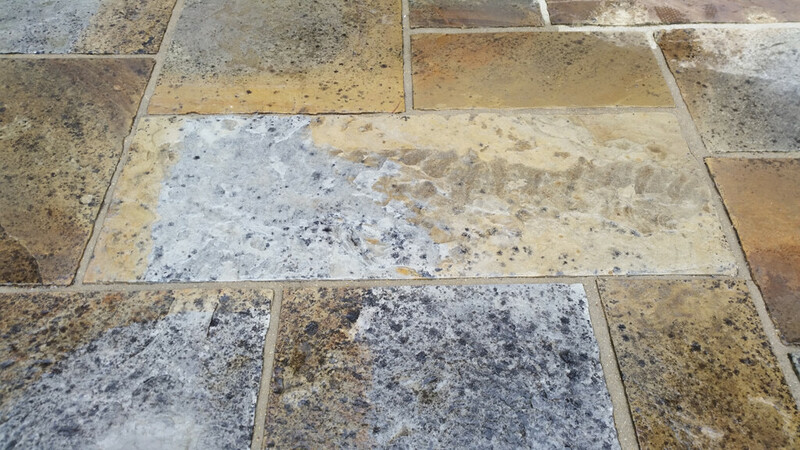 When block paving is not cleaned for long period, circular spots occur on the top surface of paver as the stain is present for long period, and these spots give an invitation to lichen (a simple slow-growing plant). So it is necessary to clean paver block. While installing interlocking paver, the proper drainage system is a must. The surface joint sand reduces the ingress of water through its joints. Because of this reason, paver blocks do not allow water to drain through its system. So homeowner needs to effectively divert rainwater on to the road surface to gutters/drainage channels. Interlocking paver block always need a strong base. Inadequate and poorly prepared sub-bases can cause the sinking of block paving due to regular traffic loads. Some contractors lay inadequate amount of sand which would cause the sinking of pavers. Or they add too much sand which also causes the sinking of pavers. Majorly sinking occurs when sand erodes from paver joints. Due to this reason, the paver losses it’s interlocking, which results in slight movement of paver which will gradually cause sinking. Installation of paver block is a multi-layering process and if laying process is not performed properly then also pavers move and sink after sometimes. Due to exposure to ultraviolet light (Sunrays), the colour of interlocking paver block may fade over a period of time. The colour of paver block can also fade due to the poor quality of admixture used during manufacturing the blocks. As with any other coloured products susceptible to the weather conditions, one cannot give a guarantee that the colour will hold through the life of block. The stability of paver block depends upon the presence of compacted sand in its joint to provide and maintain interlocking. Due to poor workmanship or bad materials used in the installation, it causes blocks to move or make them unstable. When paver blocks are installed without edging restraints, it causes the blocks to move from their original place and eventually open the gaps, resulting in loss of interlock and cause sliding or sinking. These are the few disadvantages of interlocking paver blocks. For, a fresh look of patio or driveway regular cleaning and maintenance of paver is required. However, if above factors are taken due care, being flexible to nature, it is still the better option for pavements. Unlock the Secret of Paver Block!